OpenSebJ is continuing on the up & up - with over 65,000 downloads under the belt; advanced audio and video mixing capabilities, a new track editor for even stronger pre-production composition coupled with continued and extending support for real time sample mixing; all touched up and packaged within a new Professional interface. OpenSebJ is positioned as a real contender for all your music mixing, audio composition and real time audio performance needs. Continuing in this vein OpenSebJ is branching out in to a new, uncharted frontier, fully sampled virtual instruments; this new branch of capability is packaged together and called OpenSebJ - vScaleNotes. It features a range of new capabilities at the center of it's core, one of the most prominent is the Additive Sample Technology. The new Additive Sample Technology is powered by an advanced SDL.net audio engine; which bridges many gaps, previously only available to highly complicated customised solutions. The Open Source nature of the SDL project allows these features to be capitalized on and brought to the complete populous, rather than the select few - who were prepared to pay the high price tag for the privilege. Standard and simpler sample based audio engines can only make use of a binary based approach to playing audio; the sample is either playing or it's not. If the sample is to be re-triggered the sound is first stopped and then played again; this can lead to highly audible and distracting clicks and pops in the resulting composition. This removes the flow and reality from the produced sound and is an undesirable situation. See an example of this in the following; Figure 1. 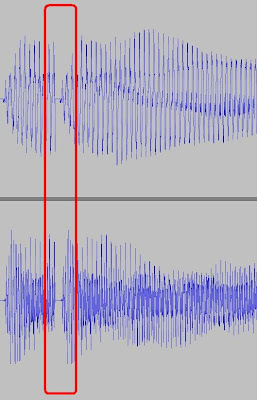 Figure 1; The section within the red boundary highlights the flat point in the audio, as a result of the sample being replayed. The Additive Sample Technology difference; is that when the same sample is re-triggered, it is done so in a new instance - a new channel is allocated and the sample is played. 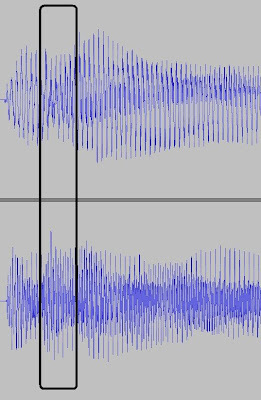 This removes the possibility of flat lines in the audio as a result of re-triggering a note or a key. See the following example, Figure 2, for a comparative view. Figure 2; The highlighted section within the black boundary shows that when an audio sample is re-triggered it is done in an additive fashion rather than a strict binary, on or off nature. Due to this OpenSebJ - vScaleNotes, sounds extremely realistic and reminiscently of the original instrument. vScaleNotes is a collection of Fully Sampled Virtual Instruments based on a full set of real instrument samples to reproduce the harmonics and intricacies of the original instrument; without the need for the original instrument or the understanding of the techniques required to correctly play the associated notes. The technique component may not be as critical to play a single note on a piano but it is certainly a contributing factor for string and wind based instruments. vScaleNotes makes extensive use of the previously developed OpenSebJ technology base & draws upon the vast experience of the OpenSebJ team; to deliver a real time, high quality performance grade system based upon solid foundations and a proven technology subsystem. The samples used for vScaleNotes have been sourced from the University of Iowa's Electronic Music Studios, without their generous contribution of high quality musical instrument samples to the public domain, vScaleNotes would only be a shell of capability. These high quality samples total over 3 Gigabytes in size; the proportion of which will be available in vScaleNotes. To make the most effective use of these samples vScaleNotes will redistribute these in the high quality, audiophile approved, Ogg Vorbis format. OpenSebJ - vScaleNotes is currently in pre-Alpha testing and as such a downloadable version is not currently available; however alpha & beta testers are being sought. All interested parties should fill out the contact form, stating reasons for interest and any relevant past experience. Even though it is currently in a pre-Alpha state, OpenSebJ - vScaleNotes, still has full support for a Virtual Piano complement; listen to a sample of a live recording, demonstrating the quality and features available in OpenSebJ - vScaleNotes.